You will probably like this game if you like polygon action games. ZTailGunner is a very simple action game where you have to shoot down enemy planes. 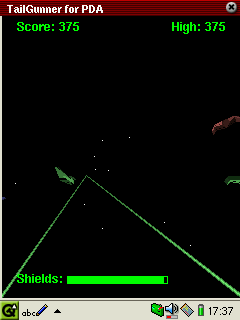 The game is programmed using polygon graphics on the Zaurus (not many dare to do this, but it kind of works). The game also comes with sound, which is also rare on the Zaurus. The game principle is easy, though. Approaching enemy planes have to be shot down with the pen before they can hit you. When they hit you the shield energy is lowered until your plane is destroyed. Although it is courageous to program polygon action graphics on the Zaurus it is not clear whether it is a good idea. The graphics looks very simple compared to a good sprite game. Also the game is very slow. A good thing is that the game comes with sound, as not many Zaurus games care to implement sound. However, enabling the sound makes the game even slower. Furthermore, the game principle is extremely simple. You just click on an enemy plane to shoot it down. This is easy if the slowness of the game down not prevent you from hitting the target. This game is also the first game which manage to crash or at least seriously lock my Zaurus. Therefore, you can try this game if you are interested in polygon graphics on the Zaurus but otherwise it is probably not worth downloading it.